Welcome back to another week of Fantasy hockey action. Can you believe we’re into December already? If you’ve been sitting on the sidelines so far, trying to figure out whether you should go for it or not, it’s time to get off the fence. Let the wire guide you! This week, the great Rick Middleton had his number retired by Boston, the 11th digit taken out circulation by the Bruins; Carolina waived goalie Scott Darling, and no one bit; and the struggling Kings got a boost as Jonathan Quick has been activated off the IR after missing a dozen games. Finally, we’ve got some site news as RotoRob was selected by Feedspot as one of Top 20 Fantasy Sports Blogs on the web. Yay, us! 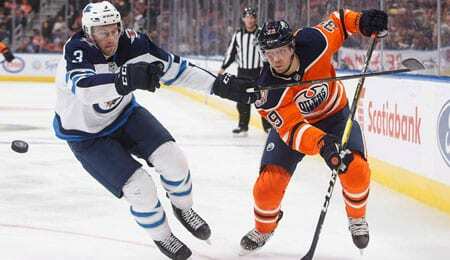 Alex Chiasson, RW, Edmonton Oilers (ESPN: 1.8 per cent; CBS: 18 per cent): Now that Ken Hitchcock has taken the reins in Edmonton, Chiasson seems to have benefited even more, although he was heating up beforehand. Chiasson potted his 11th goal in 19 games on Thursday, giving him three goals and an assist over the last four games. He was an afterthought in Washington last season, but is playing a much bigger role for the Oilers. No, Chiasson’s ridiculously good 35.5 shooting percentage won’t continue, but he brings last season’s Stanley Cup experience to a club that needs to learn how to win. The fact that he’s playing on the second line with Ryan Nugent-Hopkins is a boon to his Fantasy value and Chiasson’s size (6’4″, 208) makes him an ideal power forward, and he’s been seeing time on the PP because he can screen the goalie (see video below). Now in his seventh season, he flashed some upside early in his career with Dallas, but that’s mostly been latent since. Perhaps it is re-emerging now; it’s worth picking him up and seeing how this plays out. Riley Nash hasn’t exactly paid dividends for Columbus since being signed as a free agent last summer. But he finally scored his first goal on Thursday — in his 24th game — and added an assist. Nash is now +4 over the last four games, but has been a massive disappointment coming off his career season in Boston. Edmonton defenceman Oskar Klefbom hadn’t scored since March 4, but suddenly has goals in back-to-back games, and they were both game-winners. With two goals and three assists over the last three games, it’s safe to say his slump is over. This is a great sign after he managed a mere five goals in a disappointing effort last season. Minnesota centre Mikael Granlund has taken his game to a new level this season, and doesn’t appear to be slowing down, with a goal, four assists and a +3 rating over the last four games. He should easily surpass his career high while flirting with 80 points. Kings RW Dustin Brown was a big surprise last season en route to being one of the waiver wire darlings of the year. He’s carried on his revitalization this season, and judging by his recent play, perhaps will even build on it. With five goals and an assist over the last three games, he’s on a near 40-goal pace — despite missing 10 games already. Veteran Ottawa goalie Craig Anderson really struggled last season, and he was off to an even worst start this season, leading us to wonder if the end was near. However, he’s been better each game over the last week or so, culminating in a shutout performance against the Rangers on Thursday, his first goose egg of the season, and the 41st of his career. He’s bounced back from bad seasons before, so who knows? Vegas centre Jonathan Marchessault is still struggling to put up points like he did last season (just two assists over the last five games), but he remains on track to match his career high with 30 goals. Ranger goalie Henrik Lundqvist wasn’t at his best on Thursday, but he’d been on a major roll over the past two weeks, helping to jack his save percentage up to .924 for the month of November. Last season, he endured the worst GAA of his career, but he’s really bounced back this season and his current .920 save percentage is his highest since 2015-16. If you thought last season was Nathan MacKinnon‘s big breakout, you better think again. He was finally shut out Friday, snapping a streak of six straight multi-point games in which he had put up six goals and nine helpers for 15 points. MacKinnon is on pace for 129 points, which would be the highest total in the NHL since Mario Lemieux had 161 points in 1995-96. Winnipeg winger Nikolaj Ehlers got off to a very poor start this season, but man, is he rolling now. With a hat trick on Thursday, he now has four goals and two assists over the last four games. Ehlers is still behind last season’s pace, but is heading in the right direction after getting nearly a point per game in November. Pittsburgh backup goalie Tristan Jarry looked really good in his season debut on November 23, but man, did he ever get shellacked on Wednesday, getting ripped for five goals on 25 Colorado shots. He made some headway as a solid backup last season, but is looking very much like an AHL goalie out of his element after his last outing. Late, great American jazz composer Duke Ellington, had a career that spanned over a half century. Here he is with “Passion Flower,” penned by Billy Strayhorn in 1941 and recorded by Ellington in 1956. This entry was posted on Saturday, December 1st, 2018 at 1:01 pm	and is filed under HOCKEY, RotoRob, The Wire Troll. You can follow any responses to this entry through the RSS 2.0 feed. Both comments and pings are currently closed.